I think this brings the total to TEN: 5 Berninas, 1 Pfaff, a Featherweight, another antique Singer in a cute wooden box, and now TWO treadles. Yup, I bought another TREADLE. This treadle might work but even if it did, my legs are too long to sew on it anyway. With my extra long legs, by time I position my feet on the treadle, my rear is in the other room. Alas, it needed a good home and I’m an idiot. My other non-working treadle lives in the bathroom. Long story. Crowded bathroom. This machine is gorgeous! After a little TLC, which it won’t get sitting out in the garage, I can almost hear it humming along. The machine lifts itself out of the cabinet when you open the lid. Smart machine. Understand that if I already have a sewing machines in the bathroom, I am pretty much out of extra space already. I’m caught between a rock and an 85-pound, cob-webbed, just beginning-to-rust sewing machine. It wasn’t my fault. The dog made me do it. Yes, the dog. Not my dog. The previous owner’s dog. The dog’s name is Poochini and he sings. Well his “mother” sings and he barks in time to the music. If the treats are good. I was so impressed with the dog, I had to buy the sewing machine. I’m sure you understand the logic. Enjoy little Poochini while I move some furniture around and make room for my new treasure. If you like me here, please “like me” on Facebook by clicking the “thumbs up” icon. Get updates on the Alzheimer’s Art Quilt Initiative here. More Art For Your Lobes	I’m Going To Be On The Radio! You know, Ami, Madison is going to get jealous when he hears you’ve been hanging out with “other” dogs. I wouldn’t be surprised if he learns to sing, too! p.s.—I think your new machine is a wonderful find and would have probably bought it even if the dog didn’t sing! This is a cute video. Is this dog a Cavachon? My dog, Sweetee Pi, looks just like this dog. Wonder if I could teach Sweetee to sing. The treadle machine is great, and Poochini is amazing! Love the dog!!! Beautiful cabinet on the treadle. What kind is it? I couldn’t quite make out the name. I want a treadle, too (my sister and I used to play with our Mom’s when we were little), but my bathrooms are too crowded. I would have bought whatever she was selling too, cute Pooch!! Alas, Poochini is her sales pitch. Some people rescue animals, others rescue sewing machines. I understand both!! Oh what a picture flashed through my mind when I read about your body position if treadling. ROFL! Great find. I can’t resist these either. Someone asked me if I had a sewing machine at home and all I could do was laugh. Congrats on your find! Oh my — toooo cute doggie sinng! I once got up to 7 machines but had 4 that I had bought off ebay that were identical. It helped at home – my husband just thought I kept moving the one around the house. Had him fooled for two years. Very cute dog and nice singing. I kind of pictured the dog sitting at the sewing machine though! That would have been even better! Great find Ami. Love the treadles. I recently bought a 1915 Singer “redeye” treadle. I smile every time I walk past it. I am always on the lookout for machines, especially Featherweights. The pooch was pretty cool too. I have room for it! It’s gorgeous. My sister has my grandmother’s treadle machine and I feel left out! I use my friend’s grandmother’s (I’m “storing” it until her kids come to their senses) treddle machine as an end table in my 4 season sunporch. It has a collection of my antique sewing notions on top. Just the right height for blowing the dust off when I need to clean. Your story reminded me of my Mother-in-law who was German speaking and she would always say she was going “on the television” or “going on the radio” when she really wanted to say she was going to turn on the radio or television. She would even say she was “going on the door”, when she wanted to open the door. Her sewing related funny was when she asked why I was not wearing a “pimple”. She never could say “thimble”. My Schnauzer, Schultzie, “sang” along with Poochini, when he heard him on my iPad! Very cute! The machine looks similar to mine, which I can’t use till I have it repaired. Aren’t they great? Mine is my entry hall table. 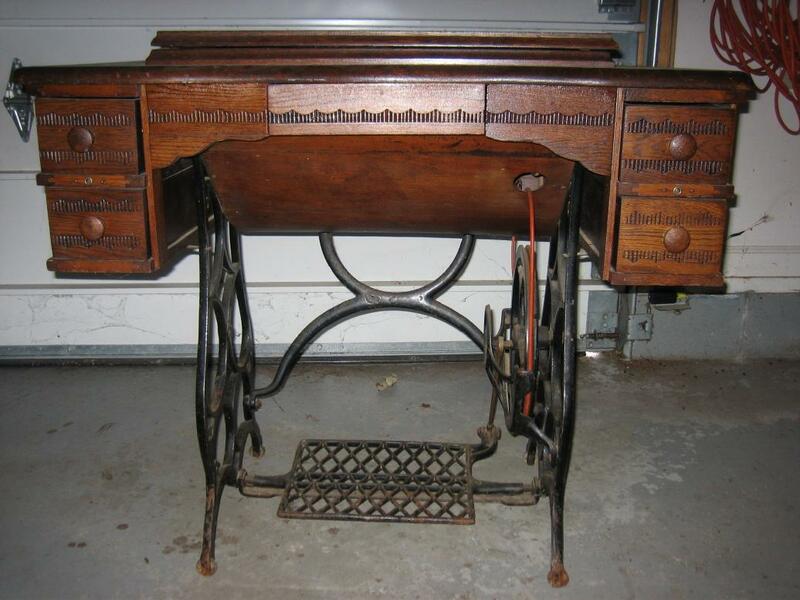 Love your new treadle. I have 7 of them, three in the living room alone where they make great lamp tables when not being use to sew things. I belong to an on line group of 1000 plus who have treadles or hand crank machines, called Treadleon. This is a great resource if you need help with these machines. Yours looks like a New Home machine, badged to sell in a department store, perhaps. THAT dog barking in perfect rhythm to THAT song made my day. Thanks so much. Love the machine. 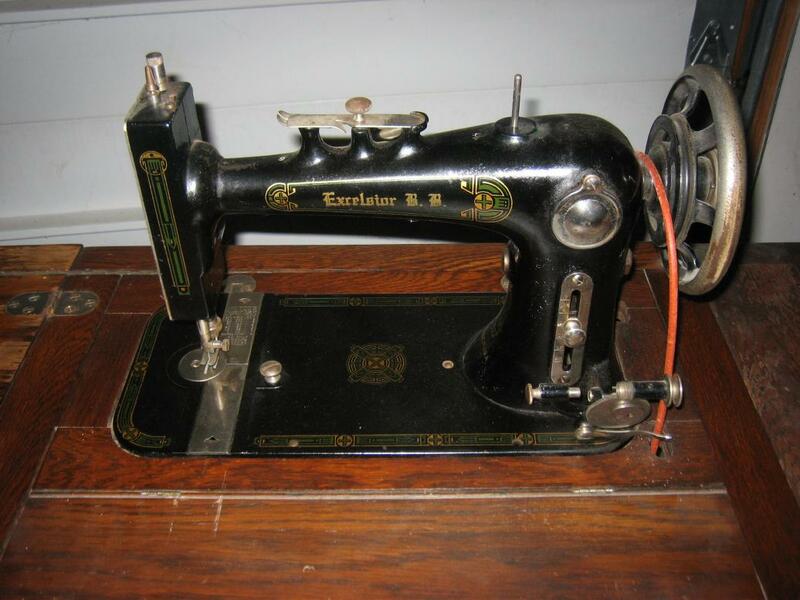 I have one that my mother used as a treadle until she got electricity, at which point she had it electrified. It’s a beauty, and I love it because it was hers. My grandmother had a machine just like this one. She made my confirmation dress for me on it many years ago. Your picture brings back fond memoriies. What a beautiful machine! I have my great-grandmother’s New Home treadle machine. When we lived in Texas shortly after getting married in the early ’80’s, we found a man who restored antique machines and had him work on mine. I made my first quilt on it. The leather belt needs replacing, but as far as I know it still works. It’s currently retired and resting in our dining room. Congrats on your new baby! Love the dog and the machine. I have three or four in the basement that I rescued or they just begged me to take them home. Some need some work, I will check into the treadle group. I have not yet gotten to the place that I can actually sew on them but it will happen. My grandmother made bunches of doll dresses on her treadle and I have always been facinated with them. I know how addictive (and space-taking) those machines are! I think I currently 8 or 9 treadles scattered throughout the house, plus about 10 hand cranks, three old electrics, a featherweight, and two modern specialty machines that seldom get used. The treadles especially are wonderful for quiltmaking, combining with perfect straight stitching, and ease of use. I also have long legs (34″) but manage on some treadles better than others just because the table is higher. It takes some looking to find one, but they are there, and you’d be amazed at how fast a quilt top goes together! Also, the handcranks are excellent for paper-piecing. And finally, for all the machine quilters out there, users swear by the treadles for that … I’m personally a hand-quilter, but I sure hear from the other kinds who love them for that. Enjoy! http://community.webshots.com/user/damascusannie in the National Sewing Machines folder. I have a set of treadle irons just like yours, and am hoping to restore another National to functionality with them. Good luck with your new beauty. Most days I feel like my top tension is vibrating, so having a machine with those same characteristics means the treadle and I are cosmic souls. You have opened a whole to world to me. Who knew there were “treadle nuts” out there. (And I mean that sincerely, and with great admiration!) I have found new friends. Thank you for your wonderful comment. I shall now refer to the “foot things” as “treadle irons.” At least I assume that’s what they are. Lead on! Ami, I forgot to mention that many treadlers with long legs have lengths of 2×4 or larger stock drilled to match the mounting holes of the irons. They are inserted between the irons and the top, raising the top and allowing for another 1-1/2″ of legroom. Interesting that when treadle machines were introduced, they were considered masculine devices, and not suitable for women to operate. I bought a treadle this weekend too!!!! It’s now in the shop getting a new belt and a tune up – I do intend to sew on it – as least I think I do!!! they’re in the car parked behind them ! Poor things really struggle. People who actually use treadle machines. Get that machine and give it to me ,it won’t fit in my bathroom ,but I have a sewing room it will love LOL. I always wanted one ,I learned in school one one. don’t want it to become unthreaded. we make pillowcases for nchildren with cancer. You need to listen to Betty Hutton’s song while sewing on your new machine. I have the treadle machine that my Mom taught me to sew on. I remember when I got into highschool Home Ec I thought those electrice machines were going to eat me a live. I would love to see how you use your bathroom treadle. I love decorating with unusual furniture. But hubby would need me to have a good reason to put it in the bathroom ??? Ami, I have the same treadle base as the one in your Oct 24 2010 post (the cabinet is different though). It belonged to my wife’s grandmother and has a National Columbian vibrating shuttle machine mounted on it. I have two questions that I hope you can help me with: (1) is there any sort of bearing where the pitman arm connects to the foot plate (can’t quite see in the photo you posted)? (2) did you ever find out how old it is? Thanks! ~Chris, I have no idea what a pitman arm is or if it has any bearing on, well, anything. But for $20 you can have the whole shooting’ match. It’s been in the garage since the day I bought it. What was I thinking!? :-) I may regret this, but sounds like a good deal (if I can work out how to collect it… what part of the world do you live in?). I’ll send you a friend request on facebook so you that you have my contact details. Ah, Michigan, so I won’t be just popping over Sunday afternoon to pick it up (I’m in Houston, TX). Looks like UPS would charge $85, even if you put it in a box and took it to them, so I’m afraid it will have to continue gracing your garage. Is there any chance you would be kind enough to post a couple of closeup photos of each end of the rod that connects the foot plate and the wheel (that’s where the bearings might be)? I would be most grateful! your machine is a beauty…i recently bought a treadle and the companys name ends in —–eff…any ideas what company could have made this sewing machine ? Your Excelsior treadle machine looks very similar to one I picked up other than the design on the decals. Any idea on where I can find out more about this particular machine? I’d love to get it working. Sorry, but you are commenting on a very old blog post.